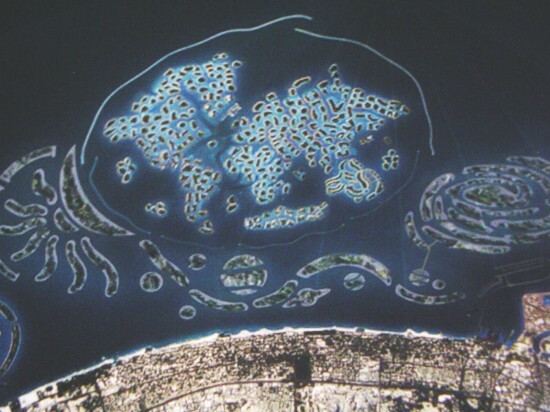 Three Palm Islands, and The World was not enough as far as Nakheel was concerned. On 19 January 2008 they announced a project to top the previous ones - The Universe, which will partially surround The World (currently under construction off the Jumeirah coast), and annoy those investors in the Southern Hemisphere who thought they were getting great views of the Dubai coastline. The Universe will stretch from Palm Jumeirah, part way to Palm Deira, between The World and the Jumeirah coast. Land area is expected to be about 2500-3000 hectares (25-30 sq km), which is probably 3 times the amount of land in The World (depending on which one of Nakheel's press releases you read). The initial design has the Sun represented on the left (near Jumeirah Palm), with the planets of the solar system represented as you head towards the right (near Port Rashid). You can clearly see the shape of Saturn as the 4th planet, assuming the Earth is not part of the trail (since "The World" has already been developed), but the relative sizes of Saturn and Mercury are a bit off. No we don't know what the cinnamon bun shape at the other end is either, but we think it represents either a galaxy (perhaps the Milky Way), or a cinnamon bun. Nakheel says the islands are "coral-shaped", so if you didn't know what the shape of coral was, now you now it's the same as planet and cinnamon bun shapes. In case you're wondering, the order of the planets from the Sun is Mercury, Venus, Earth, Mars, Asteroid Belt (not a planet), Jupiter, Saturn (with rings), Uranus (insert schoolboy comment here), Neptune, Pluto. In terms of celestial objects which Nakheel could base future developments on, we'd like to suggest they consider a small moon somewhere along a quieter part of the coastline, where we could sit and have a picnic lunch occasionally. Completion date of The Universe was expected to be sometime between 2023 and 2028 (based on initial comments in 2008 that it would take 15-20 years to complete) ... give or take a decade or so for construction delays, which are endemic in Dubai, and Nakheel in particular has a reputation for late project deliveries. Dredging work was expected to start before the end of 2008. Chris O'Donnell, the CEO of Nakheel, was reported in The National on 08 October 2008 as saying "The first proportion of The Universe has been designed up to the point where we should be able to commence reclamation work within the next two to three months". However, almost two months later, on 29/30 November 2008, it was reported that work on The Universe had been delayed, with a comment from Nakheel saying that work would be restricted to preliminary engineering studies. Dredging contracts that were to be awarded by the end of 2008 or early 2009 are not expected until much later in 2009 (the cynical might interpret that as 2010 or 2011 ... or never ...). The Universe - forum topic, add your comments. What do you think? Madness or brilliance? No website for The Universe found yet, perhaps www.theuniverse.ae or www.universe.ae eventually. Other possibilities www.universedubai.com and www.theuniverse.com are spam websites, and www.dubaiuniverse.com is under construction but might be spam also. www.nakheel.ae - Nakheel website, should have more information about The Universe one day. www.dubaifaqs.com/the-universe-dubai.php (PDF and print version).